Until recently, it has been very difficult to determine the underwater shape of glaciers because getting too close can be dangerous. Researchers are now using 'side-scanning sonars' for this purpose. These torpedo-shaped devices are towed underwater by a boat, emitting pulses of sound. They are able to map the underwater geography based on the strength of the returning echo. Although some research has been done on glaciers extending from land into the ocean, such as in Greenland, less has been done for glaciers extending into freshwater lakes. Earth scientist Shin Sugiyama of Hokkaido University and colleagues in Chile used a side-scanning sonar to study the underwater structure of Grey Glacier, a slowly moving ice mass in the Southern Patagonia Ice Field that extends with three finger-like appendages into the freshwater lake Lago Grey. They focused their attention on the eastern-most appendage and found it forms an underwater terrace extending about 100 meters beyond what's visible above water. The terrace appears to be tens of meters deep beneath the lake's surface. Pictures of a unique event in 2016 confirmed the sonar data. 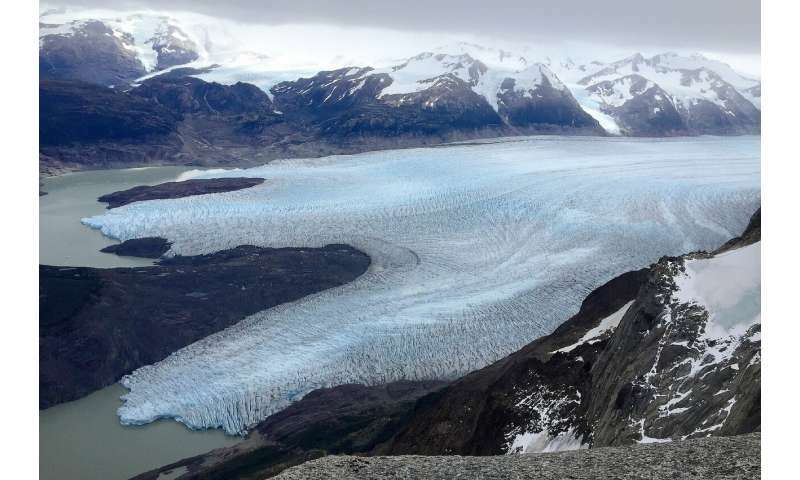 Ice broke off from the eastern appendage of Grey Glacier, and part of the submerged terrace was lifted above the water's surface, revealing its shape. This terrace structure is quite different from glaciers extending into ocean water in Greenland. Those glaciers tend to develop rough, submerged ice faces with large cavities. The cavities are formed by changing water temperatures caused by melted ice water upwelling from the glaciers' bottoms. The freshwater glacier appears to have a different dynamic. Temperature and turbidity data suggest that slightly warmer water near the lake's surface melts the subsurface ice, forming the terrace-like tongue. The buoyancy of the submerged ice affects the stability of the above-water portion of the glacier. This can lead to huge chunks of ice falling off it and part of the underwater structure suddenly jutting above the surface. 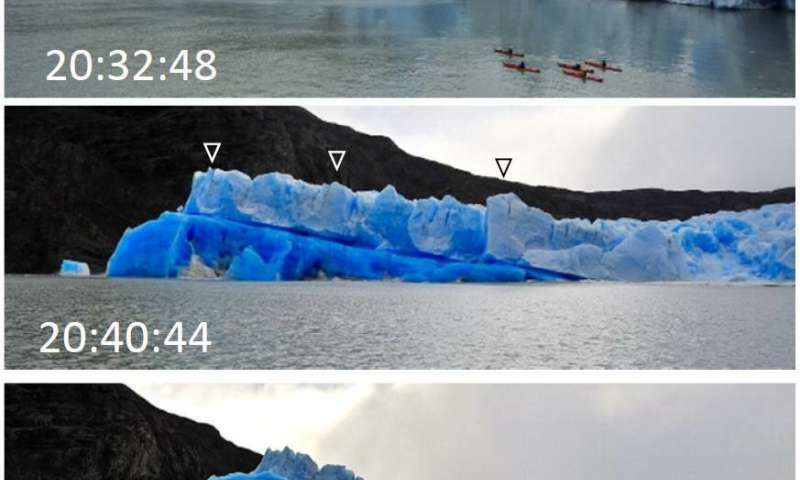 "If human activities happen in these glacial lakes, care should be taken to prevent accidents caused by the sudden emergence of underwater ice," says Sugiyama. "In the future, we plan to use the side-scanning sonar at other glaciers in Patagonia, Greenland and Antarctica. We are also willing to replace the instrument with a multi-beam sonar, which is able to capture a larger area of underwater ice from a longer distance."